On a galactic scale, light speed is a barely-discernible crawl. The speed of light, just shy of 300 million meters per second, is the theoretical speed limit of the universe. Compared to anything we encounter on a daily basis, light travels so fast that it appears to be instantaneous. But a new series of animations by NASA scientist James O’Donoghue shows how dismally slow the speed of light is compared to the scale of our solar system Business Insider reports. The videos, the first of which shows a beam of light orbiting the Earth 7.5 times per second, demonstrate why it takes so long to communicate with Mars rovers and why scientists have no feasible means of reaching or even communicating with hypothetical inhabitants of distant exoplanets. Looking only at our own planet, light still seems pretty fast. For comparison, the world’s fastest plane, an X-15, reached a top speed of 2,000 meters per second. At that speed, it would take the plane 5.5 hours to circle the planet. But once you start to zoom out, it becomes just how slow the speed of light is compared to any sort of cosmic scale. O’Donoghue’s second animation shows how long it takes for light to travel between Earth and the moon. It’s about a 2.5 second round-trip journey — still dizzyingly quick. But then O’Donoghue zooms out to show the distance between Earth and Mars. Now, watching the light travel between planets is like watching your microwave count down. In case you don’t feel like sticking around for the whole six-minute video, we reveal the ending below. Don’t read on unless you’re comfortable risking having the video spoiled! 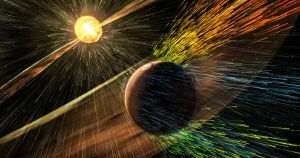 In the animation, the beam of light takes just over three minutes to travel from Earth to Mars, then takes just as long to make it back home. That’s why many Mars rovers have pre-programmed behaviors, like how NASA’s InSight automatically deployed its own landing procedure — remote controls from scientists on Earth would take too long to arrive.